Artwork Panel: 50.3cm x 96.2cm ≈ 19¾" x 37¾"
Silk/Brocade: 59.4cm x 152cm ≈ 23¼" x 59¾"
Width at Wooden Knobs: 68.4cm ≈ 27"
This is a very unique form of calligraphy. It's a Chinese character that is made to look like an actual figure. In this case, it's a horse being ridden by a cowboy or cowgirl. 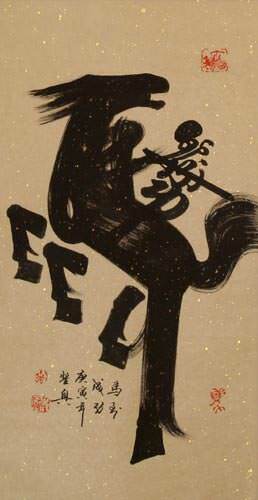 The large character is also a representation of "ma" which means horse in Chinese (also used in Japanese Kanji and old Korean Hanja). Below that is a title "ma dao cheng gong" which basically means "Where there are horses, there is success", or "Horses bring success".